An isolated church standing in the flat Lincolnshire marshes, St Botolph's is early medieval, with renovations covering the Decorated and Perpendicular Gothic periods. This spacious building is composed of a nave with clerestory, north and south aisles, south porch, chancel, and an embattled west tower. The interior of the church is almost completely bare and unadorned, with unplastered walls letting the bones of the building show. The nave arcades are Early English, with wide, slender arches and nicely carved column capitals. The south arcade, built circa 1400, has its columns built up on bases several feet high. The tower arch is much narrower, in Perpendicular style. 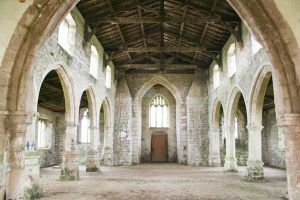 Skidbrooke has been the subject of much publicity due to reports of paranormal activity at the church. Several ghosthunters have reported unusual goings-on at the building, and the church was nicknamed 'the Demon church' after it became popular with groups of Satanists in the 1970's and 1980's. Visitors have reported seeing a ghostly monk on the site, seeing odd lights and hearing sounds of storms in calm weather, and hearing strange, unexplained noises at night. St Botolph's is no longer used for regular worship and is in the care of the Churches Conservation Trust.